Garech Domnagh Browne (25 June 1939 – 10 March 2018) was an Irish art collector, a notable patron of Irish arts, traditional Irish music in particular. He is often known by the Irish designation of his name, Garech de Brún, or alternatively Garech a Brún, especially in Ireland. He was the eldest of the three sons of The 4th Baron Oranmore and Browne and his second wife, Oonagh, daughter of The Hon. Arthur Ernest Guinness, the second son of The 1st Earl of Iveagh. Oonagh was therefore a wealthy heiress to the Guinness fortune and the youngest of the three "Golden Guinness Girls". 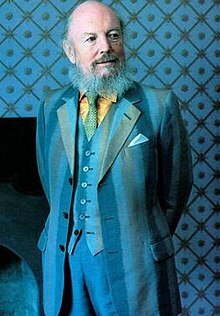 Garech's father, Lord Oranmore and Browne, had the rare distinction of sitting silently in the House of Lords for 72 years until his death at age 100 in August 2002, without ever having spoken in debate. As both his parents were married three times, he had two stepmothers and two stepfathers and also had a number of elder half siblings. His only full brother, The Hon. Tara Browne, was a young London socialite whose death at age 21 in a car crash in London's West End was immortalised in the song "A Day in the Life" by John Lennon and Paul McCartney. Garech was educated at Institut Le Rosey, Switzerland, and, although a member of the extended Guinness family, he took no active part in its brewing business. In 2008, there was a major theft of silver and rare books from his house "Luggala" in County Wicklow. A 2012 book, Luggala Days, by Robert O'Byrne details both the history of Luggala and of Garech's life. Browne once stated he would rather have not been born, calling it "frightful to bring anyone into this world". He had been a leading proponent for the revival and preservation of traditional Irish music, through his record label Claddagh Records which he founded with others in 1959. His former home, Woodtown Manor, near Dublin was for many years a welcoming place for Irish poets, writers and musicians and which was associated with the folk-pop group Clannad, where they made many recordings of their music. When in Ireland, he lived at Luggala set deep in the Wicklow Mountains. The house has been variously described as a castle or hunting lodge of large proportions which he inherited from his mother. He was interviewed at length for the Grace Notes traditional music programme on RTÉ lyric fm on 18 March 2010. Garech was instrumental in the formation of the traditional Irish folk group, The Chieftains. In 1962, after setting up Claddagh Records, he asked his friend, the famed uileann piper Paddy Moloney, to form a group for a one-off album. Paddy responded with the first line-up for The Chieftains, who went on to achieve international renown. Garech Browne by Irish artist Reginald Gray. He married in 1981 in Bombay, to HH Princess Harshad Purna Devi of Morvi. Browne died in London, on 10 March 2018, aged 78. Portraits of Garech and photos of Luggala were published in the Vanity Fair of January 2008, pages 136–137. ^ Irish Mail, 6 April 2008, pg. 20. ^ O'Byrne, Robert (October 18, 2012). Luggala Days: The story of a Guinness house. CICO Books. ISBN 1908170786. ^ Guinness heir Garech de Brún: 'I wish I hadn't been born - life doesn't stop being hell', independent.ie, 7 May 2017; retrieved 30 December 2017. ^ Grace Notes, rte.ie; accessed 11 March 2018. ^ "The Chieftains – out of this world". independent.ireland. 3 March 2012. Retrieved 11 March 2018. ^ Correspondent, Jennifer O’Brien, Ireland Arts (12 March 2018). "Hard-partying aristocrat 'was last of a breed'". Retrieved 14 March 2018 – via www.thetimes.co.uk.